Coming soon: MSc students Julie Galloway, Kalina Hunter, Kyle Nelson, and Andrew Simon, and post-doc Norah Brown! Becky has just joined us in September 2016 fresh from Oregon State University. She has loads of experience in forests and fire research in the Pacific Northwest and the drier interior of Oregon and Washington states, but somehow also loves the wet Central Coast. She was an able field assistant on the 100 Islands project summer 2016, and plans to follow that up with work on long-term human impacts on island biodiversity for a MSc project. 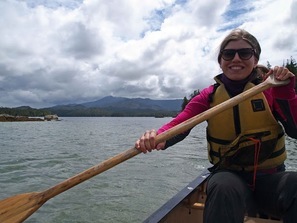 Kira Hoffman spends most of her time in the bogs and forests of Calvert and Hecate Islands in the Great Bear Rainforest. There she studies how fire has impacted these hypermaritime (very wet) systems. Some places get much more than 4m of rain per year! But they still burn: Kira is trying to figure out how and why. Although new to the coast, she is learning to love epic downpours and how to drive a boat. Check out her essay "The Bog" on Patagonia's "The Cleanest Line"
You can find out more at ﻿Kira's website﻿. Nancy started in the Starzomski lab in September 2013. Her focus is on ecosystem resilience - in its many definitions and forms - and how it can be manipulated or impacted by human activity. She is interested both in the broad theoretical questions surrounding ecosystem managment and the on-the-ground applications of ecological science. She's good at stats, writing, and organizing people: a Texas Triple-threat. Also, she's off the the University of Colorado-Boulder for a post-doc. Yes, we're all jealous. Jeff started his MSc (co-supervised with Morgan Hocking) in Fall 2014. Jeff will be working at the Hakai Beach Institute on the Central Coast, examining invert and fish communities. He'll be using environmental DNA techniques to study important fish species, especially Coho salmon. By all accounts Jeff is an excellent hockey ref, so he's likely as comfortable calling you for high-sticking as he is running a gel. Owen is a long-standing member of the lab (see below), having spent several seasons as a field assistant in the Coast Range mountains and the bogs of the Central Coast. We finally convinced him to do his MSc. in the Starzomski lab in 2015. As part of the Hakai Institute's '100 Islands' project, he will be focusing on the effects of marine-derived subsidies and island biogeography variables on plant communities of the Central Coast. Owen is interested in restoration, ecology, botany, and place-based research. In his free time he enjoys reading, painting, and exploring Cascadia. Sara started her MSc in September of 2015, but not before she got two field seasons under her belt on the beautiful Central Coast of BC. In the first, she was Kira Hoffman's able field assistant. In the second, she ran the seaweed show herself, where she measured hundreds of kg of algae and grasses washed ashore on various islands up and down the Central Coast. She's a big part of our collaborative '100 Islands' project, providing the marine-derived nutrients angle. Here's some more detail on that. She's one Delica down after the field season, but her new truck might even be nicer than our beloved lab truck, Bridget. She also has a cool new new website. 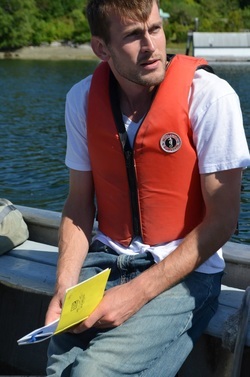 Wiebe was a post-doc on the 100 islands project, co-supervised with Trisalyn Nelson at Arizona State University. He makes mean maps, analyzes all spatial data data like nobody's business, and can cook too! He also restored this awesome canoe which I personally find as impressive as his R skills. Wiebe has moved on to a faculty position at Utrect University. Andrew is an ecologist interested in questions about how plants are responding to climate change in subarctic and alpine systems. Trees (and shrubs) are great for this because they leave behind an annual record that can tell us a lot about past climate, growth patterns and disturbance events. Andrew is also interested in understanding factors that control species' range limits and diversity in general. Andrew is now assistant professor in the Department of Environment and Resource Studies at the University of Waterloo! Kelly finished her undergrad here at UVic in 2012 and has worked in the Starzomski Lab digitizing the field notes and journals of Dr. Ian McTaggart-Cowan in partnership with the UVic library. She also manages one of our favourite projects, the Biodiversity of the Central Coast website. Here's a short piece from her fieldwork in the summer of 2015. She can do it all: write, take great pics, make websites and databases, and do great field work! 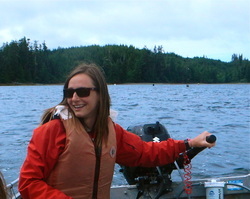 Kelly has left for foggy pastures to do a Masters of Marine Management at Dalhousie University. Bea has been working in the lab since May 2015. She started as Sara Wickham's able seaweed field assistant, and has made herself indispensable through GIS, Biodiversity of the Central Coast work with Kelly, and collating gear and data for projects around the lab and beyond. Beatrice has moved all the way across the country to St. John's to do a MSc at Memorial University. Unlike other students in the lab (no names), she flew to the right city and didn't find herself accidentally in Saint John, NB. We had Owen all over the place in 2012: starting in Victoria, he then spent half the summer on the Central Coast, and the other half wandering the Coast Range north of Whistler. Owen is careful in the field, thoughtful in the lab, and rocks a bug net all day long. We were sorry to lose him to the Ministry of Forests Research Branch last year, but glad he's back for more this summer. Francine has been working with Nancy on mite and bog related experiments, while tackling her own research on geomorphological controls on bog soil depth. Neat stuff! Sara works with Kira on a variety of projects examining fire in the landscape. She broke a borer on one of her first days but it's cool: she brings in the data, and is awesome in the lab and field. Chris worked with Julia Fisher as her field assistant on Julia's heavily kayak-based MSc project. He's interested in (and good at) everything, with great focus on the things he loves. He races kayaks with Brian and picks up languages with ease (French and Mandarin so far, and now off to Colombia to learn Spanish before starting a MSc at McGill doing research in Panama). Julia joined the Starzomski lab in 2013, a year after completing her undergraduate degree at the University of Victoria with majors in Biology and Environmental Studies. Julia is interested in how long term (past) human-landscape interactions influence present-day ecology. In the spring and summer of 2014 Julia conducted an observational study on past sites of habitation to explore how they impact present day plant communities. She now runs her own farm in the Cowichan Valley while also being a monster carpenter. Stay tuned for her cool published thesis. Jason worked on the ecology of plant-pollinator interactions in alpine and tundra ecosystems. He did a series of field experiments in the Coastal Mountains of BC to determine which factors contribute to pollen-limitation, or limit reproduction of plants in other ways. He examined how properties of plant-pollinator interactions might place pollination services at risk, or confer them resilience in the face of environmental change. 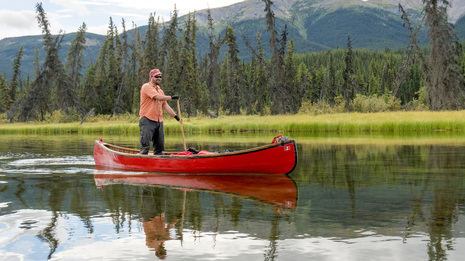 Jason is now the Parks Ecologist at Wood Buffalo National Park in Alberta/NWT. Katharine looked at the processes that are behind the patterns of biodiversity we see in nature, how they relate to spatial scale, and how they might be impacted by climate change. To answer these questions, she conducted regional surveys of alpine plant diversity in southwestern British Columbia and is determining how the patterns observed can be explained using soil, climate and topographic variables. In her spare time, she enjoys digging up Ordovician and Devonian fossils, experimental baking, watching birds and mammals, and reading up on mermaid ecology and other mythologies. She did some really awesome work here at UVic and is now on to a MSc/MBA program in Museum Studies in Berkeley. Kimberly studied how climate change has affected the endangered species whitebark pine (Pinus albicaulis) and the high-elevation plant communities associated with it. 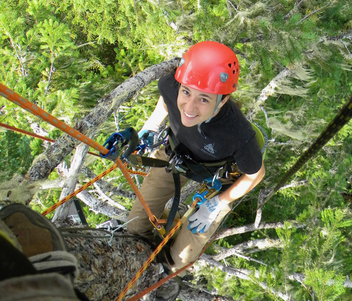 She spent two summers sampling whitebark pine stands across a precipitation gradient in the southern Coast Mountains of British Columbia to see how the tree community spatial patterns and understory vegetation differed over a range of climatic conditions. Kim is now a biologist in New Mexico, and yeah, we're all jealous. Sara Duncan's research interests lie in applied ecological restoration research for land reclamation, inspired by the research needs she perceived while working as an environmental consultant. For her Masters project, she is researching potential transplant methods for terrestrial reindeer lichens (Cladonia spp.) on reclaimed mine sites. Her primary study site is on an open pit oil sand site near Fort McMurray, Alberta, on areas targeted to be reclaimed to lichen-jackpine ecosites. 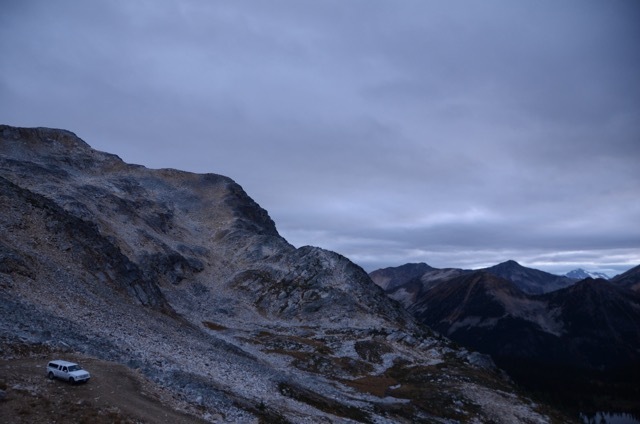 She has also been involved in lichen reclamation research in alpine caribou habitat in B.C., and hopes that the results of her research will be applicable to other reclamation and restoration projects in lichen habitats throughout B.C. and Canada. 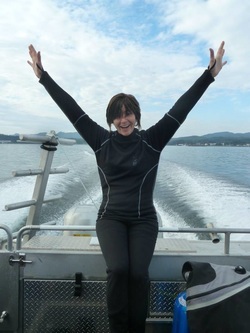 Sara was co-supervised by Val Schaefer, and is now a consulting biologist on southern Vancouver island. Sarah is interested in factors that affect terrestrial bird abundance in alpine regions, and whether avian populations in the mountain parks are within their range of natural variation. During her employment terms with Parks Canada, she collected acoustic songbird data in Yoho and Kootenay National Parks to determine the relative abundance among species, habitats and areas. In the Starzomski Lab, she analyzed these data to determine the trends in bird popualtions and communities in the mountain bloc National Parks. Sarah is now an MSc. student in the Reudink Lab at Thompson Rivers University. Seriously: check out that pic- Canada! 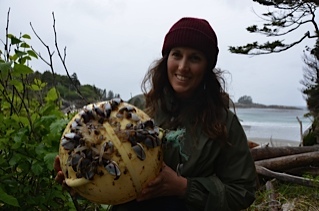 Julia worked most closely with Kira in summer 2013 at the Hakai Beach Institute. She was great at data recording, pin drops, plant ID, and is always happy (no matter how bad the blackflies). We gave her the front seat in the helicopter for her birthday. She's moved to drier pastures as a consulting biologist in Calgary. 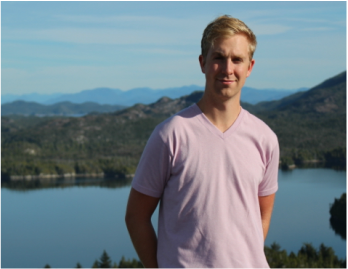 Andrew is a double lab alumni, having worked over two field seasons, getting to know the Coast Range logging roads and alpine meadows. We were sorry to lose him to the Yukon in 2013, but glad to have him back for some work at the wonderful Hakai Institute. Check out some of his observations here, and his sampling methodology here. Erika worked with Jason Straka at Marriott Basin, climbing 400m up and down everyday. She learned her pollinators and survived Jason's cooking. She's back to UVic for an MSc in Biology in the Hintz Lab. Guthrie is a man of many talents, from chainsaw to modified biodiversity plot to wow, his art. He was key in making sure no one got attacked by a mountain goat and that all the data got collected. 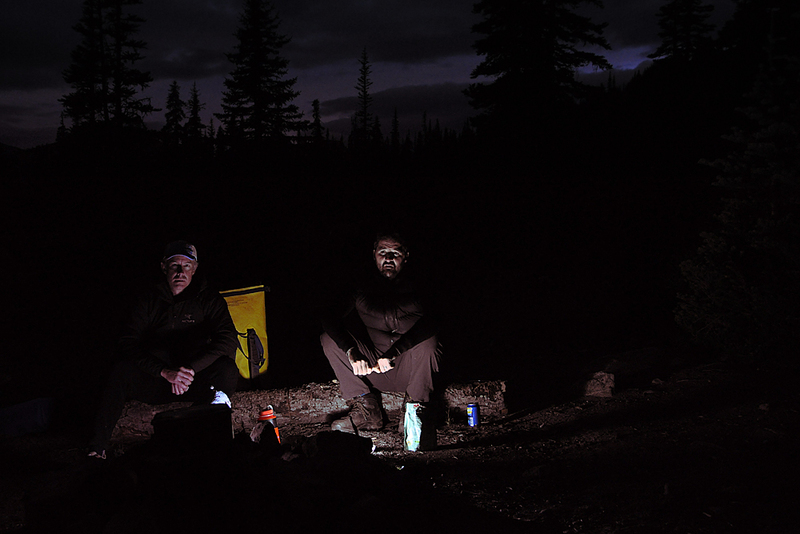 Coast Range treeline fieldwork, August 2015. Owen Fitzpatrick photo.